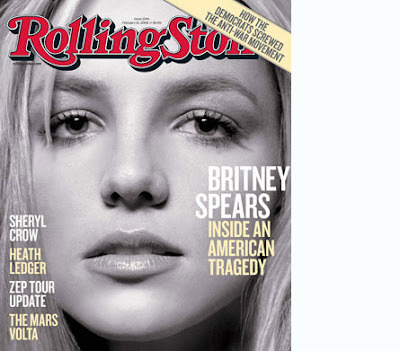 The fact that Britney's face is gracing the cover of Rolling Stone with the caption, 'Inside An American Tragedy,' speaks for itself. We admit to previously titling a post 'American Tragedy Revisted' here on the blog, but we were referring to the deaths of Nicole Brown Simpson and Ron Goldman. OJ Simpson took their lives and was never held accountable, which we happen to think is tragic. Brit Brit's drug drama and career suicide? Not so much. As of today, February 8, 2008, American families have lost 3,953 loved ones in Iraq. We're no experts, but it appears the time has come for a reality check. Mainstream media? We're talkin' to you.